In my last post I talked a little bit about the Learning Commons that opened in August at my library, a major renovation that brought exciting changes to the first floor of the Main Library. Although I wasn’t here to see the “before,” the “after” is bright, shiny, and new. It’s an appealing place with a lot more space for students to study and work: there are plenty of computer stations and a variety of flexible study spaces, including 16 group study rooms. Another major new feature of the Learning Commons? The Service Desk. The Service Desk is a consolidation of what were previously separate service points for circulation and reference into a single service point. During the day, there is typically a mix of people at the desk: a circulation assistant, a librarian or another library assistant, and a few student workers. The librarian staffing the instant message service is also on back-up for the Service Desk, in case it gets particularly busy. I don’t have any insight to the development of the Learning Commons or the Service Desk, the choices made, or future plans – especially as a relatively new employee (I’ve been in this position for four months, and have been doing shifts on the Service Desk for less than two months). I can only speak from my own experience at the desk, and as with most things, I see an upside and a downside. Good news first: I really like being out on the desk! I enjoy interacting with people, seeing how patrons use the library’s space and services, and finding out firsthand the kinds of questions people are asking. Since I haven’t done much instruction yet, right now this is how I see students the most. I think that interactions at the Service Desk can also be used to inform what I include in instruction sessions. On top of all that, every time I’m at the desk is an opportunity to get to know other people who work in the same building as me every day, but who I otherwise wouldn’t see very much if at all. Now here’s the downside, at least as far as I’m concerned: with a greater variety of questions and interactions handled at one desk, and fewer hours spent staffing the desk for any given individual, it can become more difficult to help patrons efficiently. So far I have been on the Service Desk about once a week for a two-hour shift, and it is more often the circulation aspect that I run into trouble with (sidenote: I personally don’t mind handling circulation transactions, where librarians previously would not have done this at the reference desk). When something less common comes up – creating a community borrower card, for example – it may have been weeks or months since I have last done that process, if ever. With less hours spent at the desk, there is less hands-on practice performing circulation processes, which leads to me getting frustrated when I can’t remember how to do something. I must say, this is not for lack of training: I have been trained on the circulation processes that I need to know, there are opportunities for additional training sessions, and instructional documents are easily accessible online. Also, because of the variety of employees that staff the desk, no matter what comes up, there is usually someone there that can handle it. If I don’t know the answer or don’t remember how to do something, someone else will, and I can use that as a learning opportunity for myself. However, that doesn’t make those situations any less frustrating for me when they do arise. The consolidated service desk is new for everybody, so I’m sure that time and experience will work towards smoothing out bumps in the road. But I also have to remind myself that I’m still pretty new here and have less prior knowledge about the library and collections. I’m taking things in and learning about my new environment, and to be honest, there is a lot to learn and it can be difficult to remember even simple things! The other day, somebody asked me “what floor is this call number on?” and I had to check the floorplan to be sure – that’s totally fine, but I also wish I could remember more of those little things without having to check the website or ask someone else. While out on the desk earlier this week, I came up with a way to work through the downsides I’ve encountered. Whenever I learned something new or something came up that I felt I needed a reminder on, I jotted down a quick note – starting with the call number range on each floor. To be clear, these notes are purely for my personal gain and not intended to be a record of any kind or contribute to our Service Desk stats. I’ve found in the past that I can remember something better once I’ve written it down, so by taking some quick notes when I’m at the Service Desk, I hope that these bits of information will stick in my mind better. If I had to create a community borrower card for somebody that day, I would have taken notes on that as well. 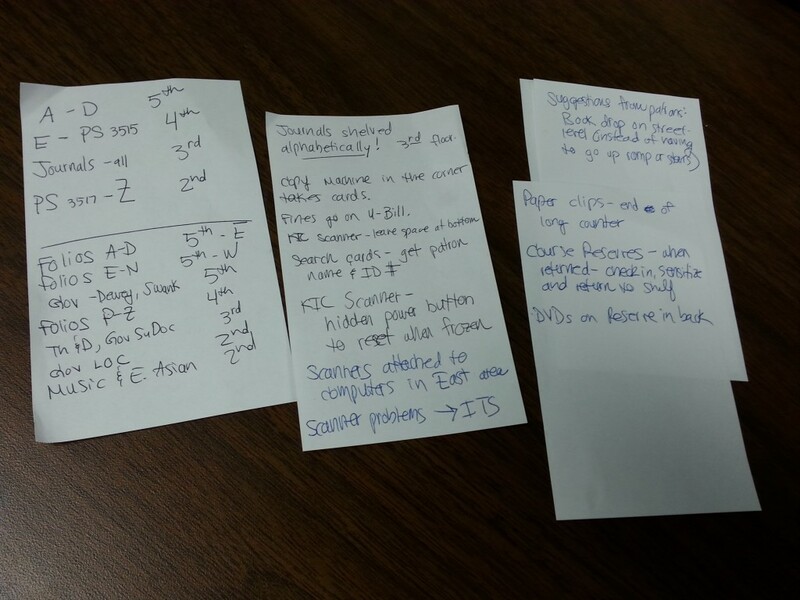 I like the fact that I learn something new whenever I staff the desk, whether it be about our online resources, common student needs, or how to troubleshoot technology (you may notice several points about a certain scanner in my notes above). I’ll continue to take these notes for now, in addition to reviewing the instructional documents for areas where I know I could use a refresher. I’m optimistic that this will help me retain more information as I continue to learn about my library, and assist patrons more efficiently and effectively. At my library we’re thinking about short and long term renovations and have been mulling over how to meet students’ needs at our Reference Desk, which tends to field the usual mix of informational, tech support, and traditional reference questions. It’s so interesting to hear the pros and cons of a single service desk, thanks for this post, Ariana!